For its age, this boat appears to be in good shape and was just serviced by its current owner. Some issues were addressed and some preventative maintenance was performed at the same time. All work was done at a local shop. Stock #160946 Recently Serviced & Ready To Hit The Water! Reason for selling is uses the other boat more. 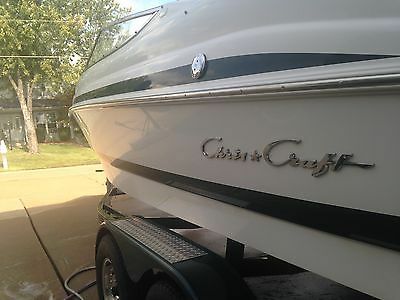 For sale is my 20' Chris Craft. This boat is in good condition and the 5.0L V8 runs great. FEATURES...-Bow and cockpit covers-New iPod ready stereo with satellite radio-All four speakers are new-Dual batteries with switch-Depth finder-Original Bimini top (barely used)-Flip up bolster seats -Snap in carpet-Lots and lots of storage ENGINE...5.0L Volvo Penta V8 I/O with only 345 hours. Well maintained. Absolutely no mechanical problems that I know of. Everything works and the engine runs perfectly. EXTERIOR...Gel coat is in good shape, very shiny, with only a few minor scratches. A couple of deeper scratches on the keel, but only gel coat deep. INTERIOR...The upholstery is in very good condition. No dry rot and no fading. There are a few small holes on the back seat where the vinyl rubs against the hinges and a tear in a seem on the sun deck. Both defects can be seen in the pics. TRAILER...Original tandem axle trailer is included. Trailer has billet aluminum rims and surge breaks. The trailer is in very good condition and quite frankly, it is a very beefy trailer. Very nice. I am only the second owner of this boat. The previous owner took very good care of the boat. 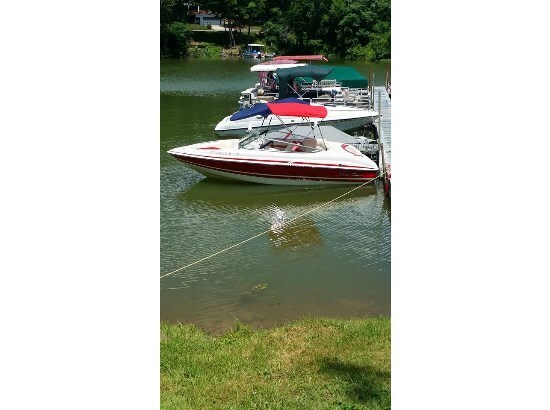 I love this boat, it runs great and is awesome for family boat trips. I am only selling it because we have a baby on the way and we could use the money. Please feel free to ask me any questions prior to bidding. Clear titles on both the boat and trailer. ** Buyer is responsible for pickup and shipping. ** Buyer is to pay a deposit of $500 upon completion of auction and the remainder to be paid in CASH only, upon pickup. No checks or money orders accepted. Thank you for considering my listing. Mark. For sale is my 20' Chris Craft. This boat is in good condition and the 5.0L V8 runs great. FEATURES...-Bow and cockpit covers-New iPod ready stereo with satellite radio-All four speakers are new-Dual batteries with switch-Depth finder-Original Bimini top (barely used)-Flip up bolster seats -Snap in carpet-Lots and lots of storage ENGINE...5.0L Volvo Penta V8 I/O with only 345 hours. Well maintained. Absolutely no mechanical problems that I know of. Everything works and the engine runs perfectly. EXTERIOR...Gel coat is in good shape, very shiny, with only a few minor scratches. A couple of deeper scratches on the keel, but only gel coat deep. INTERIOR...The upholstery is in very good condition. No dry rot and no fading. There are a few small holes on the back seat where the vinyl rubs against the hinges and a tear in a seem on the sun deck. Both defects can be seen in the pics. TRAILER...Original tandem axle trailer is included. Trailer has billet aluminum rims and surge breaks. The trailer is in very good condition and quite frankly, it is a very beefy trailer. Very nice. I am only the second owner of this boat. The previous owner took very good care of the boat. I love this boat, it runs great and is awesome for family boat trips. I am only selling it because we have a baby on the way and we could use the money. Please feel free to ask me any questions prior to bidding. Clear titles on both the boat and trailer. ** Buyer is responsible for pickup and shipping. ** Buyer is to pay a deposit of $1000 upon completion of auction and the remainder to be paid in CASH only, upon pickup. No checks or money orders accepted. Thank you for considering my listing. Mark.